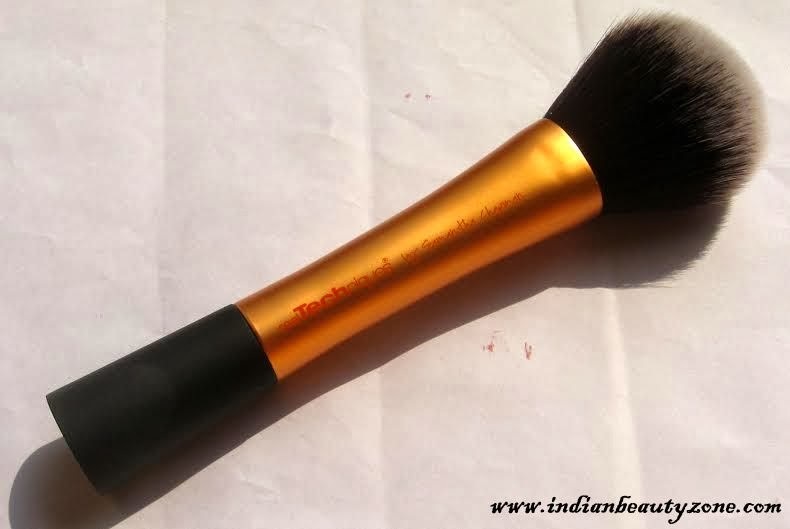 “Good Makeup brushes are always remain as a signature to a beauty bloggers” and so when the whole beauty blogging world was giving effort to create their signature brush collection, I suppose I am the only one who was moving like turtle and lading my hands on Real technique brushes every month!!! Availability: - iherb.com or feelunique.com or lookfantastic.com or from a Facebook group order makeup UK. - Extended aluminum handle is light and easy to use. Well, Real technique itself created such hype in the makeup world with their affordable brushes that I was so eager to grab few. In fact all my blogger friends grabbing one after another I couldn't resist myself to lay my hands on this brushes. Now the problem was from where to take it as it is not available in India. So finally I grab it from feelunique.com. 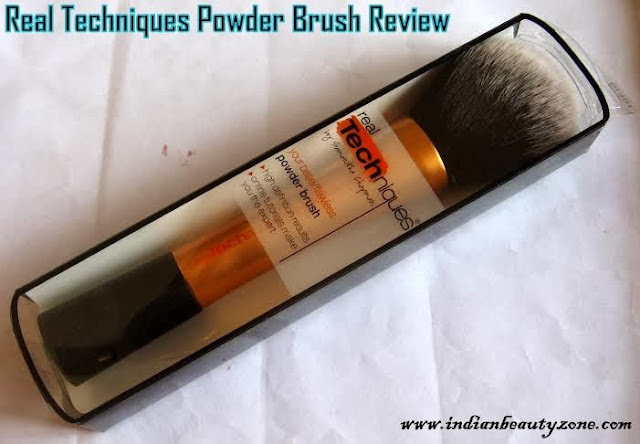 And taa daa !…here is the Real Techniques Powder Brush up for review…hehehe jokes apart. The brush is made up of aluminum thus light in weight and easy to handle. The bristles are taklon bristles which are why when it washed, it dried out super quickly. The brush is very very dense and fluffy as you can see. 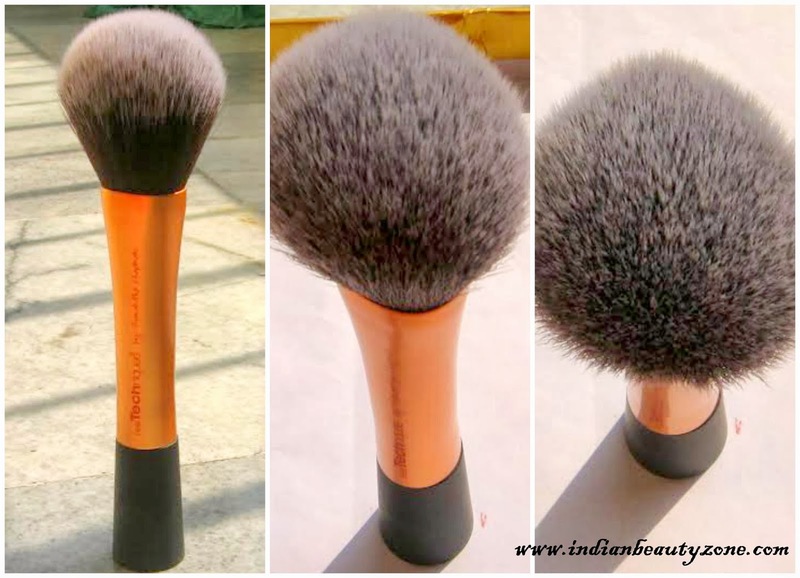 I just love the dome shape of the brush that took required amount of powder and just appropriate powder brush for your face. I am using this brush to apply mostly loose powder of compact too. But I think it is ideal for loose powder as in case of translucent powder you have to swirl your brush many times to take out the desired amount . Now coming to the packaging, the brush is little heavy compare to the blush brush I have but easy to handle as it has rubber grip at the bottom of the brush. The golden body of the brush makes the brush look attractive. And the tip of the brushes which is white in color adds a classy and professional brush look in these brushes. The bristles of the brushes are so soft that I think it can’t even scratch a new baby skin…so, despite of that the price is little high but I think I totally payoff. • Bristles are so soft. • Easy to handle due to rubber grip. • Ideal for application of loose powder mostly. • The bristles are dense. • Talk on bristles are easy to wash and dry. • As the tips of the bristles are white so it gets dirty very quickly after every application, but I don’t mind washing it as it is very easy.